The gift of hand-knitted or crocheted “prayer” or “comfort” shawls, throws and lap robes can be a source of comfort to people for a variety of reasons, such as for those struggling with health issues or coping with a loss, or celebrating a major life event. 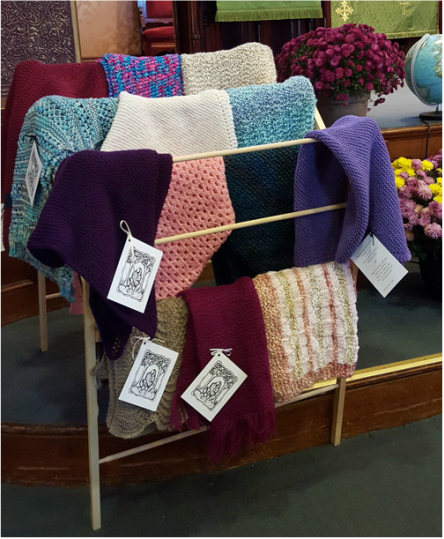 Old South Church began its prayer shawl ministry in 2004. Over 365 shawls, throws and lap robes have been given as of Fall 2015. The shawls, throws and lap robes are given for free. The individuals who make them donate the yarn and their time. Donations to help pay for yarn are greatly appreciated. In addition to the pattern below, we have a number of different patterns available. Contact Myrna Vallette at 778-3287 or myrna.vallette@gmail.com to arrange to pick one out. You may certainly use your own pattern. Also, ask Myrna if any yarn is available. If you know of anyone who could use a prayer shawl, please speak to Pastor Alexis, Phyllis Pederson, or Myrna Vallette. One of them will help you pick one out. Shapes: Rectangle, triangle, or square  your choice. Rectangular shawls should be 58 to 60 inches long and at least 23 to 24 inches wide. Triangular shawls should be about 58 inches wide at the longest edge. Throws can be smaller, and lap robes should be about 40 by 55 inches. Use yarn that is machine washable and dryable. Choose colors that would be appropriate for women, men or children, so we can have a variety available. Shawls intended for hospital patients should be made in pastels or earth tones, and with soft yarns that won’t irritate sensitive skin. To fringe or not to fringe? That depends on personal preference, the yarn, or how the finished item will look. Lap robes usually don’t have fringe. Don't know how to knit? That's what YouTube is for!